Like a camera-clicking tourist trying to get that best snapshot, Spirit is comfortably sitting at "Larry's Lookout" -- after days of wheel slipping and sliding to reach the spectacular vista. Indeed, both Spirit and its sister robot, Opportunity have in recent weeks covered more ground on the planet's surface over a handful of consecutive days, then either vehicle did in their first 70 days on Mars. Opportunity has now driven 1.87 miles (3,014 meters) since landing; Spirit even farther, 2.58 miles (4,157 meters). Opportunity is heading south toward a rugged landscape called "etched terrain," where it might find exposures of deeper layers of bedrock than it has seen so far. Meanwhile Spirit succeeded in climbing "Husband Hill." "We're at Larry's Lookout," said Steve Squyres, leader of the Mars rover science team at Cornell University in Ithaca, New York. The last few days on Mars have been spent jockeying the rover into position to take the "Lookout Pan", he added, a rover photographic assignment to fully document the view from the crest of Cumberland Ridge. Spirit is presently positioned at Larry's Lookout, some 200 feet (60 meters) above the plains. "It's kind of up high and on the left side of this valley. It really looked liked a good place to go and stand there...in a coonskin hat...and look out across the vast expanse of the valley. That was what the goal was for going there," said Larry Crumpler, the man who championed the stopover point. Crumpler is a research curator in volcanology and space sciences at the New Mexico Museum of Natural History and Science in Albuquerque, and is on the Mars rover science team. "It's a good stepping stone on our way either to the summit or something else more interesting," Crumpler said. The Columbia Hills have proven of high scientific worth, he pointed out. "Whatever it is, the Columbia Hills represent materials that are much older than the plains that we crossed coming in. Many of us feel that they are likely to represent something getting back into the wetter part of martian history," Crumpler told SPACE.com. "Whatever it is, they represent an older story...older rocks that have seen wetter times." From Larry's Lookout, a sweeping panorama of imaging is now basically done. "We're about to start moving again," Squyres said, after some nearby work before resuming the climb, he said. Hundreds of pictures have been taken from the spot. They will be used to create a spectacular view of what the rover can see. The reason for climbing to this vantage point, Squyres told SPACE.com, was to allow rover operators to make a crucial decision, either to descend into Tennessee Valley or whether to continue up Husband Hill. "We've already seen what we needed to see, and we've made the decision. We're going to climb," Squyres said. There were several reasons for the judgment. According to Squyres, the higher Spirit moves on Husband Hill, the more interesting things seem to get geologically. Second, continuing the climb gives rover scientists access to very interesting terrain on the south side of the hill, he said. Lastly, Navigation Camera images from Spirit of Tennessee Valley have not revealed anything that looks as tempting as targets up the hill and farther to the south, Squyres explained. The reach for the crest of the hill has a target date. It is driven by the need for Spirit's solar arrays to soak up as much solar energy as possible. Squyres said that by Sol 500, "give or take a little", Spirit should roll up to the new arrival point. "There's a serious celestial mechanics imperative...to make it to the top of the hill by about sol 500. We have to climb or die," Squyres said. "The seasons continue to change on Mars, with spring really coming on now. 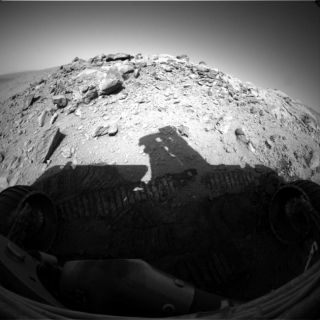 By about Sol 500 the Sun will be passing directly overhead Spirit's site at noon," Squyres continued. "So that will be a good time to be back on relatively level ground, instead of the north-facing slopes we're on now." As summer comes on at Spirit's location, the Sun moves to the south. "We'll want to transition to the south-facing slopes on the far side of the hill," Squyres said. "We have not decided whether we'll try to get to the actual summit or not. This is exceptionally difficult terrain for driving, and if time gets tight it may make more sense to skirt the summit and head around to safe terrain on the other side. But we're going up from here." In regards to when the rover will depart the area of Larry's Lookout is still an open question. "There are some very interesting targets around us, and we may spend a bit of time here before we resume the climb," Squyres said, noting that a patch of soil recently investigated has yielded a surprise. "The record for the saltiest place on Mars is now in Gusev Crater." "It seems like every time we go higher on Husband Hill, we find more interesting stuff," Squyres said. Meanwhile, on the other side of Mars, sister robot, Opportunity, continues its surveying of Meridiani Planum. Both rovers are in good shape, "but we've completely voided the warranty at this point. Every day is a gift," Squyres concluded.